Only one mature café marron tree is known to exist in the wild, but two decades of ex situ conservation efforts have elevated this Critically Endangered species from the ranks of the ‘living dead’. The island of Rodrigues, Mauritius, is part of the Mascarene Islands biodiversity hotspot, and its 42 square miles host 150 native flowering plant species, including 47 single-island endemics. Rampant historic habitat destruction and invasive species introductions have stripped Rodrigues of almost all of its native cover, driving ten of its endemic plant species extinct and threatening the rest. One such species, ‘café marron’ had been considered extinct for decades when, in 1980, a single individual was found by a schoolboy, Hedley Manan, whose teacher had sent the class to look for endemic plants. 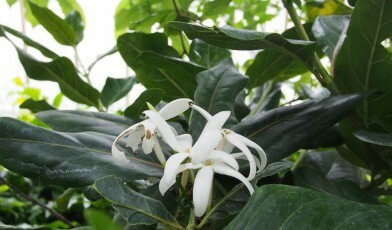 Café marron is a small tree or shrub with sweet-smelling, star-like flowers which mature from greenish-yellow to white. As with many plants on the Mascarene Islands, café marron is ‘heterophyllous’ – which means above a metre its leaves are oval and green, but lower, yonung leaves are longer, thinner and generally brown or dark red in colour. This may have been protection from now-extinct grazers like giant land tortoises and the Rodrigues solitaire (a relative of the dodo), making young leaves hard to see and unpleasant to eat. When it was found, the wild café marron individual had been grazed by goats, and subsequent damage from people collecting its parts led to the construction of several fences. Because of its precarious situation, plant material was sent to the Royal Botanic Gardens, Kew in 1986, where one cutting was successfully established. Eventually, in 2003, a combination of pollination techniques and environmental conditions allowed it to produce seeds; healthy seedlings followed in 2004 and there are now more than 50 individuals in cultivation at Kew and on Rodrigues, in the nursery of the Mauritius Wildlife Foundation. Conservation efforts on Rodrigues, with the support from the UK, have improved the outlook for café marron, but there is a long way yet to go. Many more species may be less fortunate: in 2015, a Global Trees Campaign survey found that only 26% of Endangered and Critically Endangered tree species are found in ex situ collections. Although café marron is only recorded in one collection, this has hepled the species, which was on the brink of extinction; much remains to be done to give this opportunity to other species as well. Bark from the red stinkwood tree is traditionally used to cure a variety of ailments including fever, malaria, stomach pain and kidney disease.